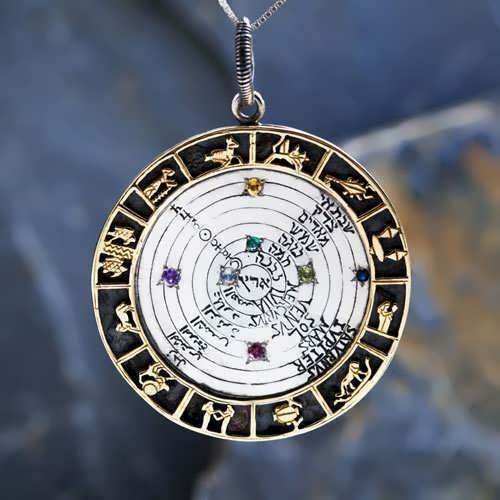 The word "Talisman," derived from the Greek verb "teleo," means, primarily, to accomplish, or bring into effect. 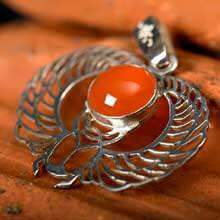 The Talisman is an object marked with magic signs and is believed to confer on its bearer supernatural powers or protection. 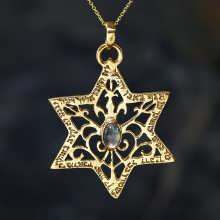 Virtually every religion in human history has offered as adherents small decorative objects which purpose is to do anything ranging between healing, protection or success. 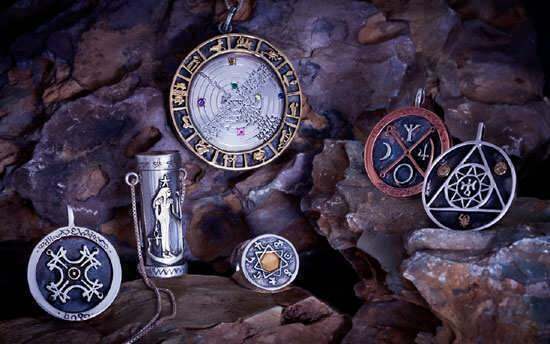 The concept of A Talisman has its roots In ancient metaphysical and cosmological world views, mainly the Hermetic and Neoplatonic Traditions. 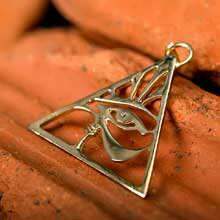 Those philosophies serve as the underlying ideas and principles that are applied in the practices of Astrology, Magic/Theurgy and Alchemy. The Ancients believed that the 'Higher' world is reflected in the 'lower', which is the basic premise of astrology and magic, and that by certain means one can Intentionally create 'images' that reflect those higher 'ideas' and their corresponding virtues, or as modern will say, the Archetypal essences or principles. 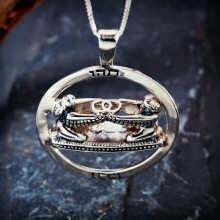 The astrological procedure of electing the right time for a Talisman (for a specific purpose) is much the same As the rules of Electional astrology, which is a branch in Astrology That is concerned with finding Auspicious times for different ventures and projects, no matter how big or small, from finding the best time to go to war, or crown a king, to a opening of a business or publishing a book, or having a weeding etc. 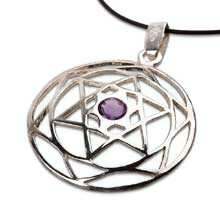 Very often the talismans symbols are taken out of sacred geometry. 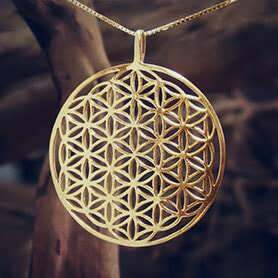 The term "sacred geometry" is used by archaeologists, anthropologists, and geometricians to encompass the religious, philosophical and spiritual beliefs that have sprung up around. 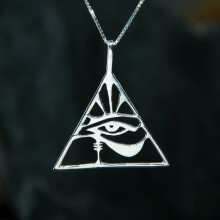 It is a term covering Pythagorean geometry and neo-Platonic geometry. 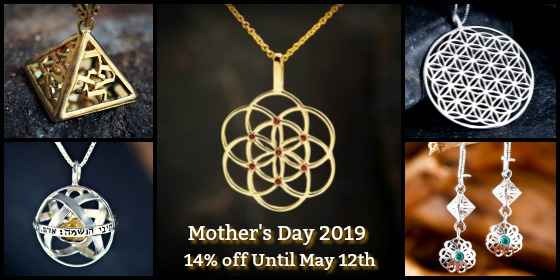 Sacred geometry is often referred to as a language of G-d. Sacred geometry symbols are a means of bringing subtle, inner realities to a focus in outward expression. Within the fundamental unity of consciousness, certain symbols, such as the lotus lifting itself in purity above the muddy water, possess universal relevance and power. 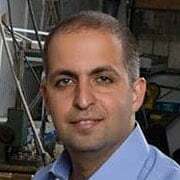 The name David in ancient Hebrew (during the time of King David) is made up of three letters "Dalet", "Vav" and "Dalet". The letter Dalet in ancient Hebrew is actually a triangle. 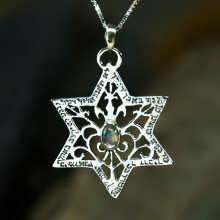 King David used the six pointed star as his signature (the two triangles of his name). The middle letter "Vav" means six - The six pointed star. 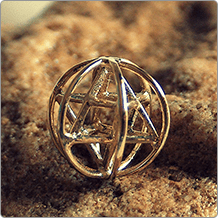 The six-points symbolize that God rules over the universe and protects us from all six directions: North, South, East, West, Up and Down. King David used this symbol in the battlefield on his shield as an omen from God. 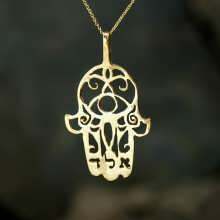 The Hamsa is known as the hand of Miriam or Hamesh hand. 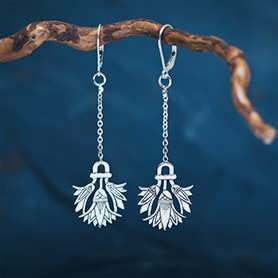 The Hamsa serves as an ancient talismanic way of averting the evil eye and providing a "protecting hand" or "Hand of God". 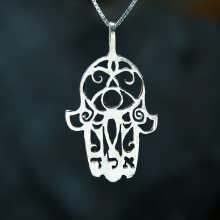 The Hamsa often appears in stylized form, as a hand with three fingers raised, and sometimes with two thumbs arranged symmetrically. 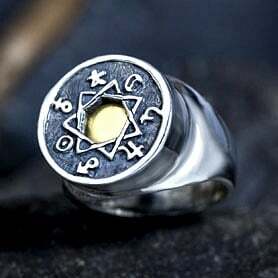 According to the ancient kabalistic text, the secret of the five metals ring success is that at the specific time of the creation of the ring with these five metals, Jupiter's influence is summoned forth. 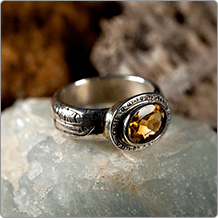 Jupiter is the star of development and expansion, and success is at it's strongest at the specific time of the ring's creation. 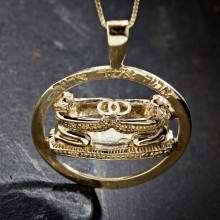 The layer on the top of the five metals ring is pure gold. 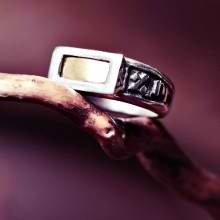 Below it there is a layer of lead and tin, and the last layer is copper, while the ring itself is made out of silver. 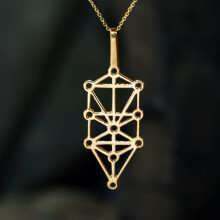 The Tree of Life is one of the most familiar of the Sacred Geometry Symbols. 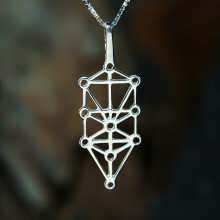 The structure of the Tree of Life is connected to the sacred teachings of the Jewish Kabbalah. The Tree of Life is explained in Sefer Yetzira ("Book of Creation"). The book explains the creation as a process involving the 10 divine numbers (sefirot) of God the Creator and the 22 letters of the Hebrew alphabet. 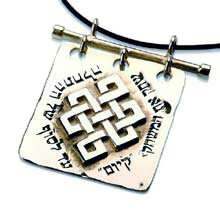 The 10 sefirot together with the 22 letters constitute the "32 paths of secret wisdom". The young scarab beetles emerged spontaneously from the burrow they were born in. Therefore they were worshipped as "Khepera", which means "the one who came forth". The scarab-beetle god Khepera was believed to push the setting sun along the sky in the same manner as the beetle with his ball of dung. 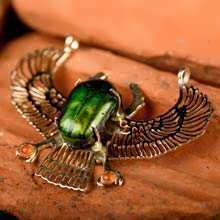 In many artifacts, the scarab is depicted pushing the sun along its course in the sky. 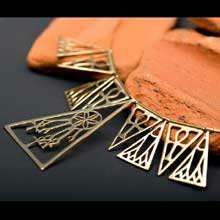 The Ankh is a symbolic representation of both Physical and Eternal life. 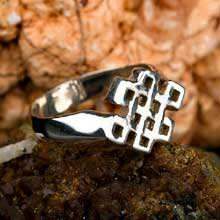 It is known as the original cross, which is a powerful symbol that was first created in Ancient Egypt. 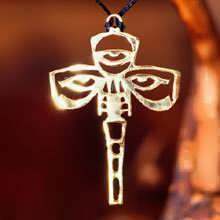 Ankh is typically associated with material things such as water, air, sun, as well as with the Gods, who are frequently pictured carrying an Ankh. In Egyptian history, the heart replaced the heart which was removed during mummification. 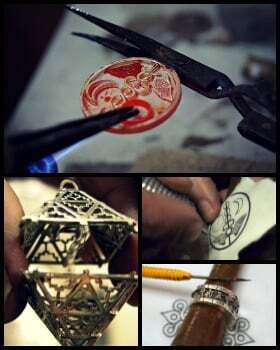 Sometimes assimilated to the Bennu, "Soul of Râ", it brings the protection of both Osiris and Râ. 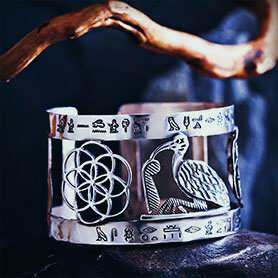 Buckle or Knot of Isis, Djed, Ba, Two Fingers and Udjat or Eye of Horus. The cross of Christianity was a symbol of the faith. 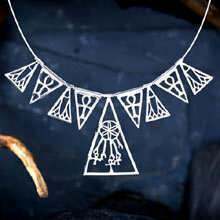 It was previously considered a pagan symbol, with several early church fathers objecting to its use. The cross represents Christ's victory over death and sin, since it is believed that through His death he conquered death itself. The fish's first known use as a Christian religious symbol was sometime within the first three centuries AD. Christians began using the Greek word for "fish" as an acronym for "Jesus Christ God's Son, Savior". Followers of Christianity were called Pisciculi; the root of this Latin word is "fish". Buddha images provide a reassuring reminder of the basic tenets of Buddhist religion. Just as Buddhist religion is practiced in many different ways, the Buddhist image also serves a wide variety of ritual purposes and has different meanings for different people. Buddha can be invested with a huge amount of information, meaning and implication; they evolve and they are given life. The Buddha image cast in the human form gives it a value presented as calm, still and serene. 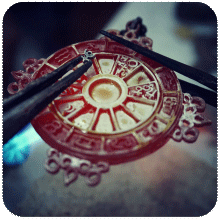 The Tibetans create their beautiful Mandalas from colored sand and if you'll take a metal plate and cover it with sand and make it vibrate with different sounds, you will be able to see different structures that are formed in the sand, that are very similar to the sand Mandalas. In the end, after a few weeks when the Mandalas is finished, they simply wipe the sand off Mandalas to show the non-attachment to the illusion of the external, and also to show the constant change and the process of life and death that takes place in the external world of illusion. Om (ॐ) is the most sacred syllable in Hinduism, first coming to light in the Vedic Tradition. The syllable is sometimes referred to as the "Udgitha" or "pranava mantra". 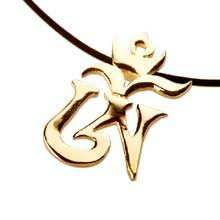 The symbol of Om contains three curves, one semicircle and a dot. The large lower curve symbolizes the waking state; the upper curve denotes deep sleep (or the unconscious) state, and the lower curve (which lies between deep sleep and the waking state) signifies the dream state. 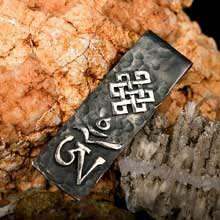 The Tibetan knot (Srivatsa or the endless knot) is one of the eight symbols of the Tibetan Buddhism. The Tibetan knot can stand for karmic consequences: pull here, something happens over there. It is an apt symbol for the Vajrayana methods: Often when we tug at one part of a knot while trying to loosen it, another part becomes tighter. You have to work with the knot to enable it to come undone. 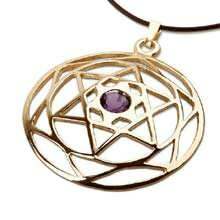 In its endless configuration, it evokes the cyclic nature of rebirth and also calls karmic connections to mind.